BIERUT - HE Dr. Talal Abu-Ghazaleh, founder and chairman of Talal Abu-Ghazaleh Global (TAG.Global), received in his office in Beirut Dr. Waseem Harb, Founder of the Arab Center for the Development of the Rule of Law and Integrity (ACRLI) and lawyer Elie Chalhoub, Director of the Center. At the beginning of the meeting, Dr. Harb expressed his appreciation for Dr. Abu-Ghazaleh’s participation in the honoring ceremony of former prime minister of Lebanon, HE Salim Al Hoss, and highly praised Dr. Abu-Ghazaleh’s speech delivered during the ceremony as a good friend to Al Hoss and as an Arab role model who deserves recognition and respect for his great role and efforts in the fields of sustainable development and good governance. Furthermore, Dr. Harb announced that the Center has recently launched the “Rule of Law in the Arab Countries” initiative, pointing out that the entire world, including universities, institutions and international organizations, is interested in teaching the Rule of Law. He also pointed out that a host of Western universities such as Stanford and Harvard introduced the Rule of Law in their curriculum, noting that the Center implemented an extensive project in the field of Judicial Independence in 2003 in four Arab countries including Morocco, Egypt, Jordan and Lebanon. “Through various visits conducted by ACRLI to many Arab universities, we found out that a few number of universities teach Human Rights and Good Governance. However, not a single university teaches Rule of Law. 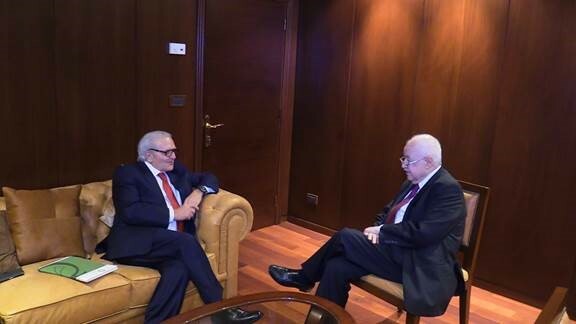 Following the failure of the ‘Arab Spring’ in the Arab region, we believe it’s our responsibility to disseminate knowledge of basic principles of Rule of Law and Good Governance in the Arab countries,” Harb added. Furthermore, Dr. Harb expressed hope to sign a memorandum of understanding with TAG-Global in this regard, noting that a Board of Trustees and a Steering Committee will be set up for this project. For his part, Dr. Abu-Ghazleh expressed his interest in this initiative, suggesting that it be implemented under the auspices of the League of Arab States to gain further regional momentum. It is noteworthy to mention that Dr. Abu-Ghazaleh chairs the Arab States Research and Education Network (ASREN) and the Arab Organization for Quality Assurance in Education (AROQA) which operate under the Arab League’s umbrella, with the League's Secretary General as Honorary Chair. “Talal Abu-Ghazaleh Academy (TAG-Academy) is the largest academy worldwide that offers training courses in different fields excluding Law. However, we, at TAG-Academy are ready to offer diploma programs in the Rule of Law field to be accredited by TAG.Global,” Dr. Abu-Ghazaleh said. “We will be represented by TAG-Academy to better market the program at a wide scale”, pointing out that the program will later become available online, and suggested changing the name of the initiative into “The Arab Organization for the Rule of Law and Government Performance Measurement”.